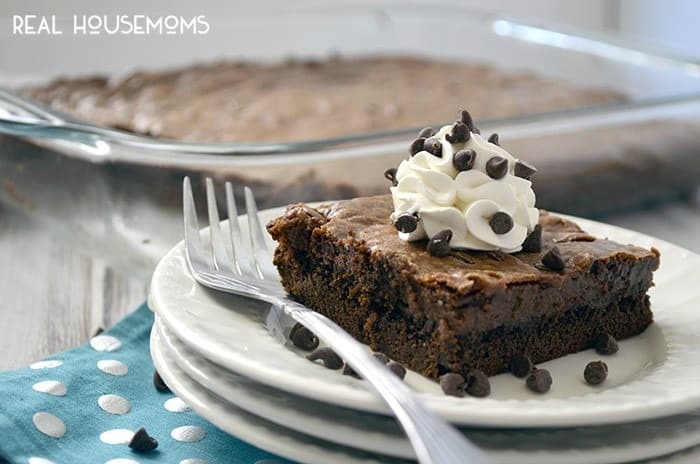 TRIPLE CHOCOLATE GOOEY CAKE is crazy easy to make and so incredibly decadent! It is finally the summer. Kids are out of school, the sun is shining and it’s time for those BBQ’s and family gatherings. We all know that at the heart of all these activities is amazing food. If you like me I love good food but don’t want to spend all day in the kitchen and dirty every dish cooking that amazing food. I like to take short cuts. Ones that will get me out of the kitchen in no time. 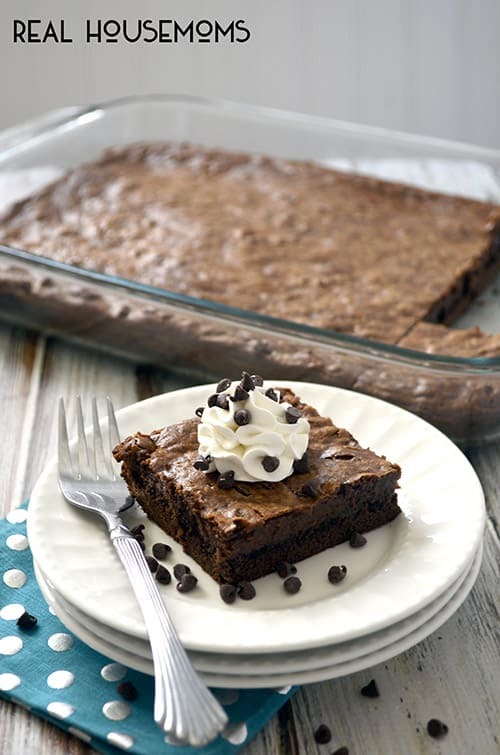 This Triple Chocolate Gooey Cake is not only easy but takes very little time to make. As I mentioned I like to take short cuts and this recipe is no exception. 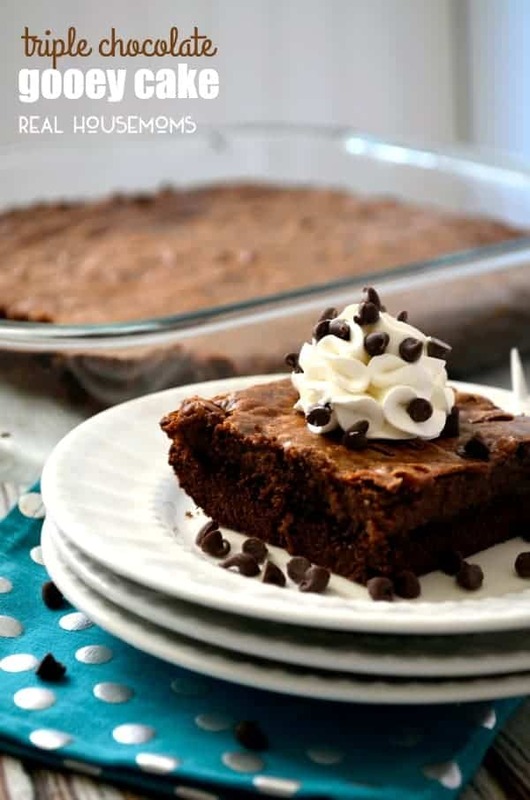 Starting with a store-bought cake mix, this gooey cake is a cross between a dense and rich brownie topped with a decadent cheesecake like topping. Now to go one more step over the top you can put a scoop of your favorite ice cream on top of a dollop of fresh whipped cream. I topped mine with the latter and then sprinkled more chocolate chips on top. 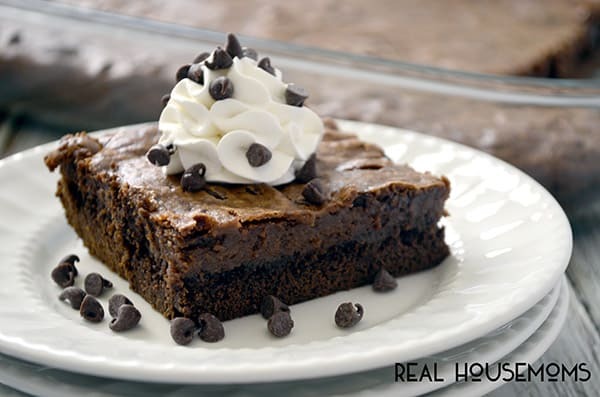 The triple chocolate comes from using deep rich baking cocoa, semi-sweet chocolate chips, and milk chocolate chips. I also used a cake mix that had mini chocolate chips in it, so technically there are 4 types of chocolate in this cake. The bottom of the cake is moist and brownie like and the top oh the top is creamy like a cheesecake what is not to love about this? I have to admit this cake is not the prettiest cake but with that whipped cream on top it dresses it up and makes it look scrumptious. 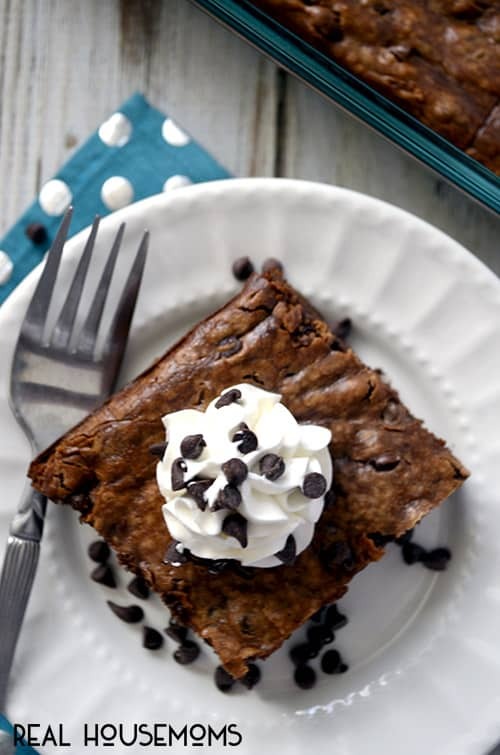 You can serve this cake warm and let that ice cream melt all over it or cold with creamy whipped cream on top. I can guardsmen that there will be no leftovers of this cake. If you have chocolate lovers around you better stand back because they will run you over just to get a piece of this cake. Heat oven to 350° F. Grease 13 x 9-inch (3-quart) baking dish with butter or cooking spray. In large bowl, mix cake mix, 1/2 cup of the melted butter, 1 egg and 1 teaspoon of vanilla. Press in bottom of baking dish. Set aside. In another large bowl, beat cream cheese with electric mixer on medium speed until smooth. Add remaining 2 eggs and baking cocoa; beat until smooth. On low speed, add powdered sugar in two additions. Add remaining 1/4 cup melted butter and 1 teaspoon of vanilla; beat until smooth. Stir in chocolate chips. Spread in pan on top of cake mix mixture. Bake 40 to 50 minutes or until center appears set but still slightly jiggles when shaken. Cool at least 30 minutes. Serve with whipped cream.